Early Warning: Are Winters Getting Warmer in Ithaca, NY? Are Winters Getting Warmer in Ithaca, NY? This is of somewhat local interest, though perhaps it's also an example that may be educational elsewhere. It's common around here to have long-time residents say that the winter weather is both warmer and more volatile than it used to be, and that this must be due to global warming. After hearing a particularly dramatic story of this ilk recently, I thought it would be interesting to look at the data. I found data for the Cornell weather station here and took the average January low as my metric of winter conditions. The graph is above, with the blue line being the data, and the red line a centered moving average. I have made no corrections for heat island effects and the like - if anything the Cornell campus has grown over time which might have been expected to create a (probably very slight) warming trend. You can see immediately what people are referring to - it was four or five degrees colder in the seventies and eighties than recently - certainly enough to notice. However, attribution of this local change to global warming is made problematic by the fact that it was considerably warmer than now back in the thirties and forties. The data as a whole do not show an upward trend. Also, the degree of volatility is not obviously more pronounced than in the past. The climate here has always been very volatile year-to-year with swings of as much as fifteen degrees Fahrenheit not unknown. Conclusion: there is multi-decadal noise in local (and no doubt regional) temperature signals that means a clear global warming signal cannot be extracted from them (yet, anyway). You have to look at larger scale averages to confidently see anthropogenic climate change. And the corollary would be that you cannot be confident that the climate will warm in your particular location in the next decade or two - it probably will, but not necessarily. Don't stake your credibility on it. I'm glad to see these kinds of admissions. Climate scientists have erred in staking all their credibility on the theory that it's going to get noticeably warmer everywhere on a short-term scale. This has caused a huge fuss about the single question of "warming" when the effects of waste, pollution, resource exhaustion, etc. are undeniable and frightening. According to IPCC AR5 report the equilibrium climate sensitivity is likely in the range of 1.5 C to 4.5 C. The transient climate response is likely 1.0 C to 2.5 C in a scenario where the CO2 has doubled after an increase by 1% per year. In the last 50 years the CO2 content of the atmosphere has increase from 310 ppm to 400 ppm. Thus I guess it will take a while before we see the full effect of our CO2 emissions. I'm not certain about this, but I'm pretty sure that the Cornell weather station moved at some point or points in that sequence. That might change the heat island and other effects, since I seem to remember that it used to be on top of a building. That may complicate the data. Simon - I looked around for that possibility but couldn't find any documentation of it. It seems it's currently in a field at Game Farm Rd, which would be pretty much free of heat island issues. Lars: Yes, so an interesting question is when will global warming have gone far enough to be clearly visible everywhere (or let's say in 99% of locations on the planet). I don't know the answer to that. A related question is what's the smallest scale of averaging now which will guarantee a positive trend everywhere. which pretty much answers my second question above for the US at least. Most of the south east and quite a bit of the midwest has a negative trend over the last 100 years, so you'd need to average over almost the whole country to get a positive trend. Also, this link shows a chart of Jan avg temperatures for the whole of NY state. There is no trend obvious to the naked eye (though possibly statistical analysis might reveal a small trend). If you squint at the U.S. EPA's temperature trends map that Stuart Staniford provided a link to, it says the the temperature around Ithaca, NY, increased by 2° C over the past 100 years, yet the EarlyWarn graph contradicts that. The article the map appears on says most of the warming is concentrated in higher average winter temperatures. 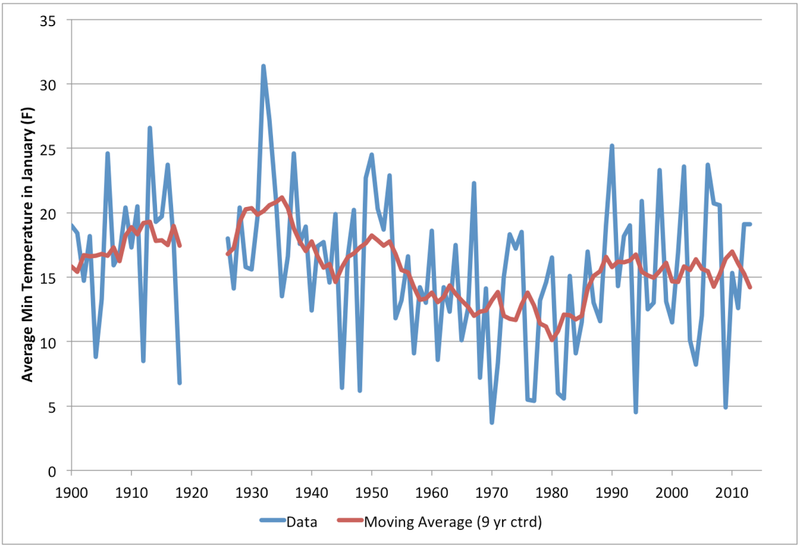 Average summer temperatures haven't changed much over the 100 year time span. That shows Jan as having a negligible but slightly negative trend. However, the other months vary - some months have a pronounced positive trend, and others have a flat or slight negative trend. So it may be that on average the climate has warmed, but the individual months are noisy enough that the trend has not been clear in every month. I also understood that global warming was expected to impact winter and nighttime more than summer and daytime. However, in New York state as a whole, Jan temperatures have not increased. In other news, I was having breakfast in a cafe in this morning where one of the regulars was regaling me with stories of his childhood where the snow drifts where regularly as high as telephone poles! The last link to estimated monthly warming or cooling trends in Ithaca uses data only through 1994. However, it does show how noisy the raw data is at just one collection station, with very wide 95% confidence bands. At one collection station, the noise masks whatever warming "signal" might be embedded in the data. Mark: That was my conclusion also. Today we have to first look at parameters which include some global integration such as sea level rise, thereafter parameters with integration over continents such as glaciers and length of growing season and firstly thereafter average regional temperatures. I guess that local temperatures will at least not in my lifetime be a clearly visible sign of global warming everywhere on earth. The worst possible scenario from a reserve point of view, RCP 6.0, leads to a global heat-up of 3.0 C (with climate sensitivity 3.0) year 2100 which may not be enough to see the temperature effects on all locations. (The scenario RCP 8.5 is not possible from a reserve point of view. For example I guess nobody believes that we can continue increase or oil production up to 400 bpd year 2100. However if the transient climate sensitivity will show to be 4.5 C the time scale will be totally different. I'd be leary of looking at average minimums; as you've pointed out, based on global data that Hansen put together I think, while mean yearly temperatures are going up in most places on the planet, the distribution is also broadening, so minimum temperatures in any given month may not be changing much. Is there enough data to get average heating degree days for January over time for Ithaca? I bet that will show a decreasing trend. Might the slowing Rossby waves and more frequent break-throughs of the polar vortex translate into colder average winter temperatures in Ithaca and similar places over the longer run? Another possibility for the temperatures at Ithaca is that they're real and that they're a consequence of pollutants such as soot and sulphur dioxide. The general wind direction is generally from west to east. That's a wide industrial belt to the west of Ithaca, particularly during the period where the slope is obviously sloping downward. That the graph bottoms out in 1980 seems highly suggestive; perhaps industrial clean-up, heavy industry slowdown and finally global warming kicking in. Still more hypotheses to throw around. OK, I downloaded heating degree day data from NOAA for the "central lakes" region of New York, and totaled up the HDDs for each year from 1895 through 2012. There's no significant trend. There is a large variation from year to year. (Standard deviation is about 440 HDD with mean of about 6800 HDD.) This reinforces Stuart's point; global warming trend can be hard to see in small-scale regional data. Well, I'm going to be a critic here. The use of lowest temperature is not going to show what is most typical characteristic of winter temperature. And winter is longer than the month of January. I'm also not too keen relying on moving averages for trending because they tend to produce artificial cyclic patterns from the randomness in the data as one could see by running them on random time series (Slutsky-Yule effect). Thor, with all due respect, your trend analysis is incomplete because you did not include March. There are a lot of cold days in November and April too in that part of the world. I cannot imagine any climatologist worth his salt would claim temperatures are going up everywhere. We are experiencing a noisy cycle that is trending up. "Noisy", "cycle" and "trending" should not be too hard to understand, but evidently they are. I grew up in Upstate NY and currently live in Texas. Texas is counter-cyclical. Hot and dry in the La Nina phase, cool and wet in the El Nino phase. We almost burned down in 2011. We are currently stuck in the 20s at night with sleet. We have recently been colder than Nome. If this is an El Nino akin to '98 things will get interesting globally, but Texas should be relatively pleasant. And, yes, the late 60s and early 70s were very snowy in NYS. My daughter at the University of Rochester has been disappointed: too little snow! Regarding your question of when will climate change be obvious everywhere, there was some work done on this last year. See this article for more info. Should a meta-analysis of 39 global computer models be considered a definitive scientific study? I didn't say it was a definitive study, just that some work has been done on the question. If you want to assign a low rating to it, that's up to you. SS - This is off thread from an old admirer of your enthralling posts @ TOD. This "early warning" is very much in your style. D. P.
Stuart, back in December you said that you would get back to blogging on a weekly schedule. Have you changed your mind? Weirdly, it somewhat resembles the charts for this past winter, except that often this winter central Siberia was just as cold as the eastern part of the United States. Also this winter, the north Pacific and north Atlantic were considerably warmer than the continents. Hmmm did you hang up your blogging hat? I can kind of see how real life can get in the way. I will say as far as one of the major themes of this blog, Peak Oil, is something I find far less worrisome than I did a decade ago. There is always the pollyanna accusation, but Solar has the capacity to supply current needs. We can move it around. But while some headway has been made on storage, and I expect to see more, this is as always the showstopper. Still I think that most of the Peak Oil sites always glossed over our ability to distribute electricity. It makes something that has some inconveniences like solar PV a lot more useful. As far as the happy motoring society, eh I'm not to attached to that. But if the United States wanted to replicate the society it had previous to WWII as regards personal mobility and living arrangements I think that is eminently doable with technology as it exists now and will in the short term. I check in occasionally to Early Warning to see if you have started blogging again. Are you finished completely now? Realise in life that stuff happens. Good to know if you have hung up your hat permanently. Anyway. all the best with whatever you are doing now. I look forward to your come back. This is a plot of the average Dec - Feb temperatures from 1895 to 2015 and there is a clear increasing trend.